Sigal Samuel, a playwright and journalist, released her debut novel, The Mystics of Mile End earlier this month. 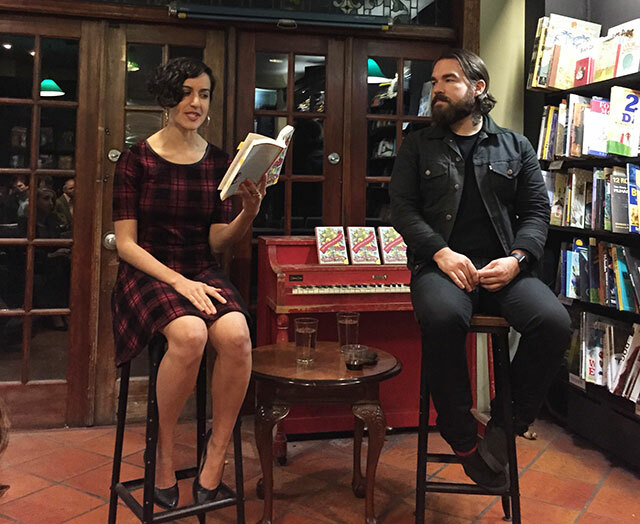 She spoke with Buzzfeed’s Isaac Fitzgerald at Community Bookstore. The novel is written in four voices from a family living in Mile End, a neighborhood in Montreal. Samuel describes the place as a mix of Hasids and hipsters, a lot like Brooklyn’s South Williamsburg. Communication is a theme at the heart of the novel and the choices between silence and language. Which of those is better, Samuel asks. This family is terrible at communicating, and yet they think they are great at it. The book plays with the idea of inventing words to describe highly specific sensations. Fitzgerald points out that Samuel grew up in Montreal, although not in the Mile End neighborhood. Why then set the book there? “I always wished I was from Mile End,” Samuel says. She is actually from the suburbs of Montreal, Côte Saint-Luc. Mile End has a reputation for artists while Côte Saint-Luc is insular, she explains. The choice was about neighborhood envy, she says, and wishing she was from a cooler neighborhood. Through the book, the parents of the family move in opposite spiritual trajectories. The mother grows more religious as the father grows less. The mother dies. There is likely symbolism there. Symbolism played an essential role in Samuel’s life. Her father was a professor of comparative mysticism. She describes him as a nerdier, jewish version of Sean Connery’s character in the film Indiana Jones and the Last Crusade. As a result, she grew up with a lot of symbolism. It was all very confusing, she says. At the beginning of the book is an image of the tree of life, the ten vessels of God’s divine light according to Kabbalah mysticism. Accordingly, the goal is to climb up the structure to become one with the divinity. The novel also takes cues from Shakespeare’s King Lear. “I’m a Shakespeare nerd,” Samuel says. Then she corrects herself and says she is many kinds of nerd in actuality. Samuel admits that she is also really into SETI, much like one of the characters from the novel. “I may or may not have had a telescope and processed SETI data on my computer,” she says. Earlier in the week, NASA released data suggesting an alien megastructure could be responsible for odd signals from a distant star. “It’s aliens until proven not aliens,” Samuel jokes.